On Saturday, Feb. 27, AALDEF is collaborating with RAISE, the Teen Resource Center, and the Charles B. Wang Community Health Center to conduct a legal rights workshop on immigration issues, including green cards, citizenship, Deferred Action for Childhood Arrivals (DACA), Deferred Action for Parents of American Citizens and Permanent Residents (DAPA), work authorization, in-state tuition, and deportation relief. The workshop begins with a general information session from 11 am to 1 pm, followed by confidential one-on-one consultations with attorneys from 2 pm to 4 pm. The workshop will be held at the Charles B. Wang Community Health Center, 125 Walker Street, 2nd floor in New York City. The phone number is 212-226-2044. 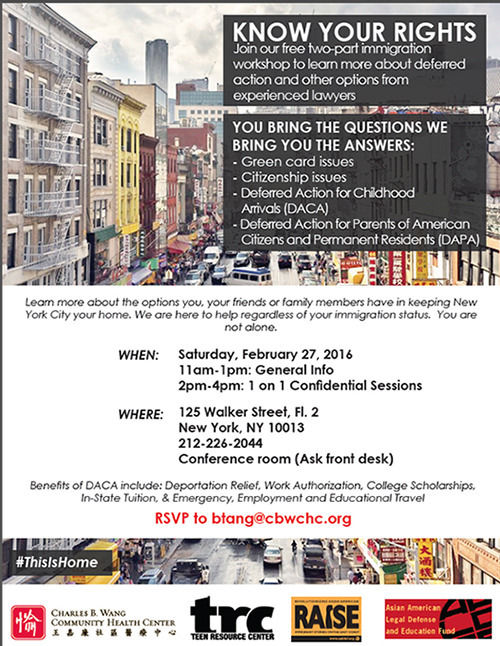 Please RSVP to btang@cwchc.org.